Trinity Catholic coach Mike Walsh reacts to a call on the court in the first half against Canton in the CIAC 2019 State Girls Basketball Tournament Class S Finals at the Mohegan Sun Arena in Uncasville on Saturday. Trinity Catholic defeated Canton 52-45. UNCASVILLE — Mike Walsh was supposed to be in Florida. Instead, he was on the court at Mohegan Sun Arena in Uncasville, hoisting the CIAC Class S girls basketball trophy over his head, sporting an ear-to-ear smile rather than a tan. “I’m supposed to be in Florida right now. But I will give that up for this,” said Walsh, whose team rode Iyanna Lops to a 52-45 victory over Canton Saturday at Mohegan Sun. The longtime coach of the boys team at Trinity Catholic retired following last season with 633 wins, the fourth most in state history. Trinity Catholic boys teams under Walsh won seven CIAC state championships and six FCIAC titles as the Crusaders reached the state final 13 times and the FCIAC championship game 11 times, beginning with Walsh’s first FCIAC title in 1993. This was his first girls championship. Walsh got an unexpected phone call while vacationing in Florida on holiday break, telling him Trinity girls coach Mike Martino stepped down unexpectedly at the end of December. The legendary coach was asked to step in and guide the girls team the rest of the way through the season. Out of undying loyalty to Trinity Catholic, Walsh gave up his time in the sun, returning to take over the team beginning with a game at Staples Jan. 2. Trinity went 10-3 under Walsh, finishing the regular season at 15-4. The Crusaders lost to Norwalk in the FCIAC championship game but rallied in the Class S tournament, winning five straight, including the championship game 52-45 over No. 1 seed Canton. Lops scored a game-high 26 points and said the Crusaders would not have been holding the championship trophy had it not been for Walsh. 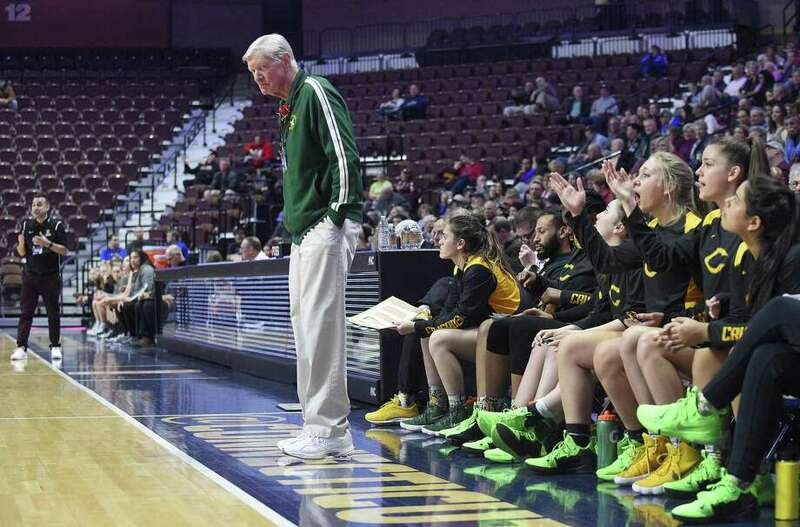 Walsh, who seemed rejuvenated emotionally by coaching the girls, said standing on the court at Mohegan Sun with a state championship in his hands could not have been further from his mind back in December.